You have all that music and other audio content to listen to, and beyond downloading and organizing your selections, that’s what Music is mainly for. You’ll find the typical playback tools in the Music app, but in case you want a refresher, here’s the quick rundown on how to use Music as a player. If you can’t find what you want by going through collections or categories, you can search for an item in your Music library by using the Search feature. You can enter an artist’s, audiobook author’s, or composer’s name or a word from the item’s title in the Search field to find what you’re looking for. 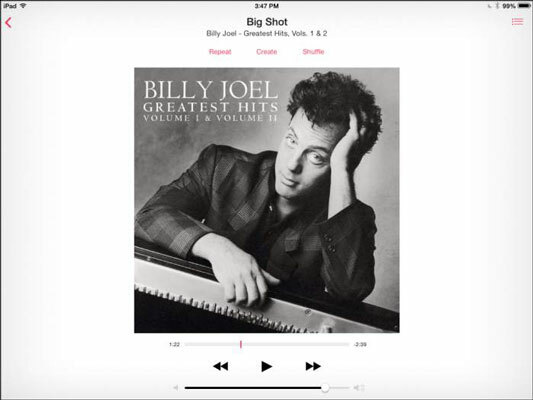 You can also ask Siri to play a selection or use the Spotlight Search feature from the Home screen to search for music. 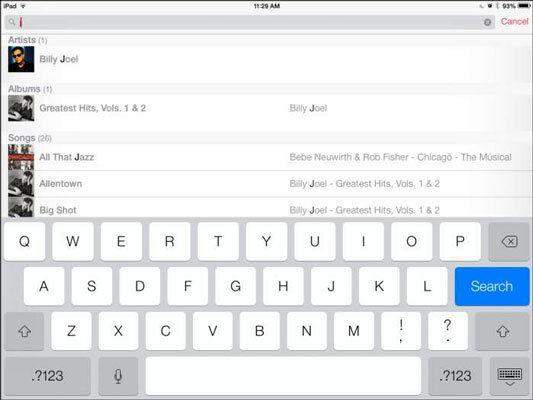 With the Music app open, tap in the Search field. The onscreen keyboard opens. Enter a search term in the Search field. Or tap the Dictation key on the onscreen keyboard of an iPad (the Dictation key is not present on the iPad 2) to speak the search term, and then tap the Search button on the keyboard. Results display, narrowing the search as you type. Now just tap any item in the Search results to play it. 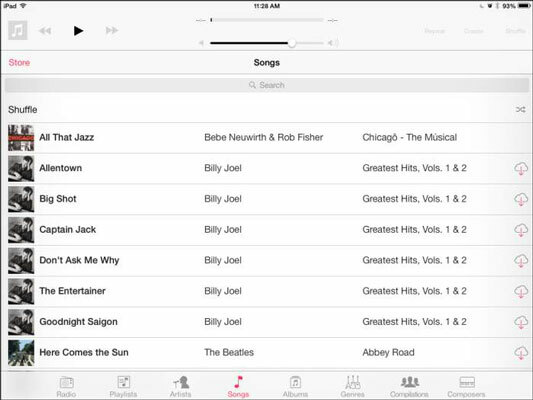 If you want to play a random selection of the music you’ve purchased or synced through iCloud or from your computer to your iPad, use the Shuffle feature. 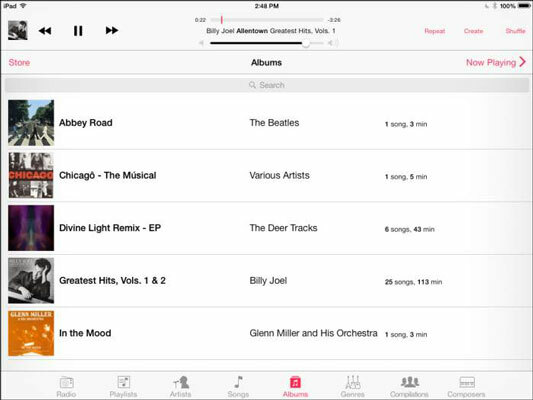 With the Music app open, tap the Songs or Albums button at the bottom of the screen. Tap the Shuffle button shown. Your content plays in random order. Music offers its own volume control that you can adjust during playback. This volume is set relative to the system volume you control using iPad’s Settings; if you set it to 50%, it will play at 50 percent of the system volume setting. With Music open, tap a piece of music to play it. In the controls that appear onscreen, press and drag the button on the Volume slider to the right for more volume or to the left for less volume. To mute iPad’s speaker at any time, press the Mute button to the left of the volume slider or, if it’s set up to control volume, slide the Silent switch on the side of your iPad to the Mute setting. If you have volume set at high and you’re still having trouble hearing, consider getting a headset. These devices cut out extraneous noises and should improve the sound quality of what you’re listening to. Try using a 3.5mm stereo headphone (a 1⁄8” headphone sometimes works fairly well) and insert it in the headphone jack at the top of your iPad. You can also use Apple’s iPod or iPhone EarPods, which work just fine with iPad. The iPhone EarPods include a microphone as well.